This post is written by John M. Talbot, Chair of the Political Economy of the World System section of the American Sociological Association. It is part of the Journal of Agrarian Change blog, hosted on the Development Studies at SOAS blog. 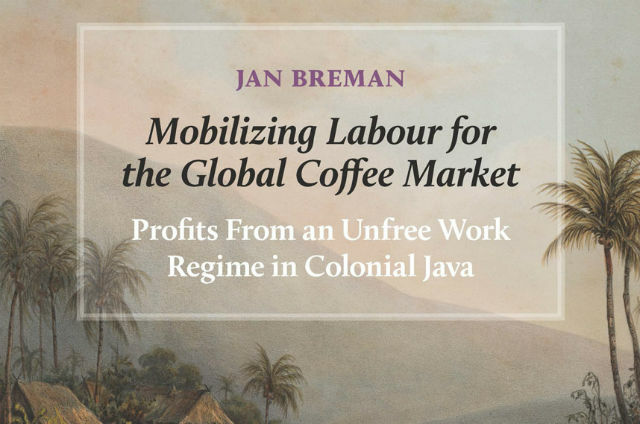 Mobilizing Labour for the Global Coffee Market: Profits from an Unfree Work Regime in Colonial Java, by Jan Breman. Amsterdam: Amsterdam University Press, 2015. Pp. 404 + 8 Plates €99 (hb). ISBN 978-90-8964-859-4. This is a book of impressive scope. It tells the story of coffee cultivation on Java under Dutch colonialism from its beginnings in the early 1600s through to the end of the notorious Cultivation System in the late 1800s. It focuses on the Priangan Highlands of West Java, which was the main coffee-producing region during most of the colonial period. It was here that a system of forced cultivation was introduced in the early 1700s. This evolved into the model for the Cultivation System that was imposed on the whole island in the 1830s. The book begins by describing the Dutch East India Company’s (VOC’s) efforts to take control of the thriving inter-regional trade conducted by Javanese, Gujaratis, Malays, Arabs, Chinese, and others; and to extend its territorial control inland from Batavia (modern day Jakarta). The two efforts were interrelated because the competitive advantage of the existing traders was based on the relationships they had established with the local nobility controlling agricultural production on Java. Once the VOC imposed its political control inland, it exerted monopoly control over exports from West Java, and through that over the Batavia node of the larger inter-regional trade. This project was completed by about 1700. Early on, coffee was one of a number of products purchased by the VOC from West Java for the inter-regional trade. However, as the Dutch rose to be a hegemonic power in the world economy in the early 1700s, their interests narrowed to products that could be exported to Europe. They focused on coffee, which had been introduced to major cities in Europe in the late 1600s and was in high demand. By the 1720s, they began ordering the local chiefs to deliver fixed amounts of coffee to their warehouses, while lowering the price they were willing to pay for it in order to maximize their profits in Europe. Thus began the system of forced cultivation of coffee in the Priangan that remained in effect until the 1870s. The VOC pushed its agenda by offering a share of the profits to the local Chiefs who exerted control over the peasantry. They chose this route in part because they had little understanding of the structure of the society they had colonized, but once they started down this road it proved nearly impossible to turn back. Forced cultivation provoked such hatred of coffee among the peasantry that continued coercion became the only means of insuring a steady and increasing supply. The VOC went out of business at the end of the 1700s, due in part to internal corruption and rising debt. During the Napoleonic Wars, the British took control of the Dutch colonies and introduced some reforms in the rest of Java, but maintained the forced cultivation system in the Priangan, for the same reason that the VOC had kept it through the 1700s. In 1815, Java was returned to Dutch rule, and the Dutch state took over the administration of the system, now with a view to maximizing its revenues to pay off its debts. To do so, it tried to exert more direct control over production. Under the VOC, peasants had planted coffee in the areas around their small settlements and paddy fields. The scattered nature of the cultivation made it difficult for colonial officials to monitor exactly how much was being produced, so they told peasants to establish large coffee gardens on the hillsides above the settlements in the valleys. In these enclosed monocultures, it was much easier to monitor the labour process as well as the amount of coffee that was being produced. It took an enormous amount of labour to establish the gardens and plant the coffee, and four years until the trees began producing, but due to poor cultivation and maintenance practices, their productivity began to decline after only three or four harvests. New gardens were then established in what Breman describes as a plantation variant of slash and burn agriculture. The newer gardens were further from the settlements, sometimes requiring two or more days’ journey to reach them, so that whole families were required to relocate to the coffee gardens during the harvest season, which could last for a few months. Here, they were forced to live in the open-sided sheds used for drying the coffee. Under the earlier version of forced cultivation, better-off peasants hired the labour of poorer and landless peasants, and when peasant households were required to provide corvée services to local chiefs, these same better-off peasants avoided it by sending their labourers in their place. So it was the poorer peasants who did the bulk of the coffee cultivation work, either by working on the lands of the better-off peasants or on the lands controlled by the chiefs. When cultivation was moved to the coffee gardens in the hills, where the scale of cultivation was much larger and the work more intensive, it was once again the poorest peasants who were most affected. As news of stagnant or declining production and reports of the brutality of the system began to filter back to the Netherlands, a debate over colonial policy began. One of the most important contributions was a novel published in 1860 by a former colonial official, taking the pseudonym Multatuli (meaning, I have suffered much), entitled Max Havelaar, Or the Coffee Auctions of the Dutch Trading Company. In it, he exposed the arrogance and corruption of most colonial officials, as well as the fact that they had been covering up the violent nature of the system for many decades. The government finally abolished the system in 1871. Breman suggests that, to some extent, the forced cultivation system continued after this decree. However, it marked a “transition to a system of colonial exploitation based on the free market” (p. 341). The state took formal ownership of all uncultivated land, meaning that peasants could no longer clear new land to produce their own food. This land was now available to be leased to European corporations for tea and rubber plantations. While better-off peasants, with access to sufficient land, did well and increased their holdings, the poorer peasantry were proletarianized, providing a large labour force for the plantations. This is a very brief outline of the story told in this book. It is impossible to go into the details, but I would like to mention a couple of themes that run through it, that will be familiar to all students of colonialism. First, the colonizers developed a racist ideology to justify their brutal exploitation. They depicted the Javanese as “lazy and slothful” (p. 102), and incapable of improving their living standards, and projected forced labour as part of colonialism’s “civilizing mission”. Second, the Javanese resisted, occasionally openly, but more often by using ‘weapons of the weak’. The peasants deserted. The Priangan was a sparsely settled frontier and there were usually more remote lands where they could go and establish subsistence production. They buried their coffee or threw it into gorges to avoid the arduous journey to the colonial warehouses. They sold it to smugglers, who paid a higher price than they received from their chiefs, despite Dutch efforts to seal off the Priangan region and regulate movement within it through a pass system. The local chiefs competed with the Dutch for control over labour. They needed peasants to tend their fields and provide a range of other services. So they distorted population figures, deliberately underreporting the numbers of people who lived in their districts in order to minimize the numbers of labourers or amounts of coffee they were required to supply to the colonizers. They also received payments for the coffee their peasants delivered and routinely deducted more than their share, meaning that the peasants who did all the work received very little for it. And as always, the burden fell most heavily on the poorest, the land-poor and landless peasants.